When I’m lecturing on strategic policy or Australian force structure issues, I often make a comment about the ‘defence of Australia’ (DOA) doctrine along those lines of ‘of course, the defence of Australia has been of academic interest except for six months in 1942’. It’s a rhetorical device intended to convey the idea that DOA really isn’t very relevant to a contemporary discussion of Australia’s future defence plans. But, as any mathematician would remind me, a single counter example is enough to completely undo a hypothesis. In 1942, war really did come to Australia’s shores and the ‘air sea approaches’ were used by Japanese ships, aircraft and submarines. The purpose of this book, edited by ANU’s Peter Dean with contributions from a number of historians, is to put those events into context. Like two volumes of essays on military history that precede this one, there’s a bit of a ‘Mythbusters’ feel to it in places. There are several chapters that examine Japan’s aims towards Australia, including one (the most valuable one in my view) from Japanese scholar Hiroyuki Shindo. He argues convincingly that that the Japanese Army was dragged kicking and screaming by the Navy into the South Pacific, when its own priorities were China and Manchuria. His conclusion is clear; the resources for an invasion weren’t going to be made available and isolation of Australia, rather than conquest, was the Japanese intention. In this light, the pivotal battle along the Kokoda trail is put into its proper context. 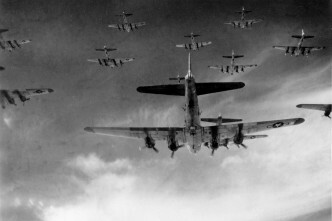 It denied the Japanese a base in Port Moresby from which it could strike allied bases in Queensland and interdict allied shipping and allowed the allies to use it for their own air and naval campaigns, rather than ‘saving Australia from invasion’. This conclusion might raise the ire of some, but the story of the struggles of the land forces involved actually loses nothing by being accurately placed in the overall story of the Pacific campaign. In a book with multiple contributors, it’s almost inevitable that there’ll be a little unevenness and that’s the case here. There’s also a bit of repetition, as the various authors inevitably work the same events into their own perspectives. Because of that, I’d recommend that you read the chapters individually and at intervals—they are sufficiently stand alone to do that. But there’s a lot of value here, both as history and as a prompt for thinking through the notions of DOA, self-reliance and some of the other memes that have been used so often in strategy debates that we sometimes lose sight of why they are thought to matter. Provided that we’re careful to disentangle the general principles from the specifics of the time, there are some important lessons here for those of us who contemplate force structures and the strategies they’re meant to support. After reading is book, I haven’t changed my mind about the shallowness and irrelevance of ‘pure DOA’ as a planning construct. Projecting force against a continent across the distances involved in our theatre is a formidable task that requires substantial naval assets and control of the air above them. 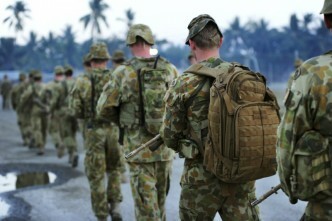 An adversary that can establish those conditions close enough to Australia to directly threaten us, and who can assemble and protect the necessary forces for a land campaign, has already done most of the job. As this book makes clear, the Japanese were defeated in a series of naval, air and land battles that mostly took place far from our shores. We needed a major ally to successfully fight them (after losing one that couldn’t). 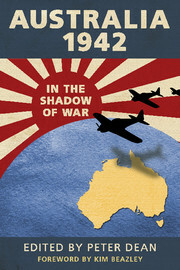 And, to the extent that we were able to contribute, we needed forces that could deploy forward—even if, as the book shows, the RAAF and Army were in no state to do so at the start of the Pacific War after a long period of austerity. It’s hard to see why both of those requirements wouldn’t also be the case in the future. Anyone arguing otherwise needs to explain what’s changed since 1942.